Reading Gone with the Wind did a number on me this year, and made me a lot more interested in reading other books set during the Civil War. 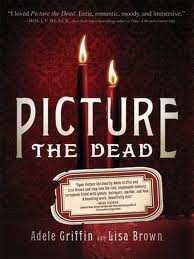 When I first heard about Picture the Dead, a book combining both the Civil War and spiritualist photography I was eager to read it. The icing on the cake was having the chance to interview both Adele Griffin and Lisa Brown for the first episode of the Underground Literary Society podcast I co-host with Nicole of Linus's Blanket. The Civil War actually plays a relatively minor role in the book. It does set up the ability to explore certain ideas and frame the time of the story, but it is many ways simply a background to the individual tale of grief and loss Jennie experiences. She has lost the love of her life in the Civil War. She has previously lost her parents and is at the mercy of her relatives who have no strong feelings of goodwill towards her. Her standing with them changes throughout the story. The family goes to a spirit photographer and Jennie believes she sees a ghost. She thinks the ghost is leading her on a path to solve a mystery and she begins investigating. I enjoyed Picture the Dead for a few reasons. I really enjoyed the exploration of how the world was changing for the United States at the time with the advent of photography and being able to record images of loved ones as well as the first time the country experiences such massive loss. I found the pictures to be an interesting touch and they contain clues to the story as well. I have to admit to feeling a bit disappointed it wasn't a little creepier, and even though the book isn't long, I still felt the story could have been condensed a little bit. But it was still an enjoyable read and a different kind of story.